Sometime during the past week I got it in my head that I wanted shortbread topped with cranberry sauce. I searched around for a recipe that looked good, but none of them sounded quite like what I was craving. I finally decided to just take matters into my own hands. A lot of bar recipes use a base that’s cookie-like, but not quite a shortbread. My craving was specifically for shortbread, so I adapted a Dorie Greenspan shortbread cookie recipe to make the base. It’s perfect, if I may say so myself! The base is buttery and melt-in-your-mouth tender, without crumbling to pieces when you pick it up. It’s also very flavorful, thanks to the cinnamon and pecans. The tart cranberry sauce on top compliments the shortbread perfectly so that the end result is something like a lemon bar, but with cranberries. In other words, delicious. I used a combination of the two leftover cranberry sauces I had in my fridge for this recipe. Your own homemade cranberry sauce should work for this recipe too, as long as it’s not too watery. This may work with canned cranberry sauce, but I haven’t tried that yet. Preheat to oven to 350°F. Line an 8×8 pan with foil, leaving about 2 inches of overhang on opposite ends. Lightly grease with baking spray or butter. In a food processor, pulse flour, sugar, powdered sugar, salt, cinnamon and pecans. Add diced butter and pulse until a coarse meal forms. Add egg yolk and continue pulsing until large clumps form, but stop before dough forms a ball. Press dough into prepared pan. Prick all over with a fork. Bake 15-20 minutes at 350°F or until the edges are just barely browned. Cool 5 minutes. Meanwhile, heat cranberry sauce on stove. If sauce is watery, add 1/4 teaspoon of cornstarch at a time until no longer runny. When shortbread has cooled, top with warm cranberry sauce. Cover and chill until set. Cut into 16 small or 9 large squares. Dust with powdered sugar before serving. Your cranberry pecan shortbread bars look so yummy. I love your picture. It’s so beautiful :) Love the recipe! Mmm. Yes. The best of all cravings. I made something similar to this last year but the crust was more flaky than shortbready. Delicious but probably not exactly what you were looking for. I need to try this version. Looks like we are on the same page, I was craving shortbread this weekend, too! I made cookies, though. But I still want more shortbread (it’s so good! 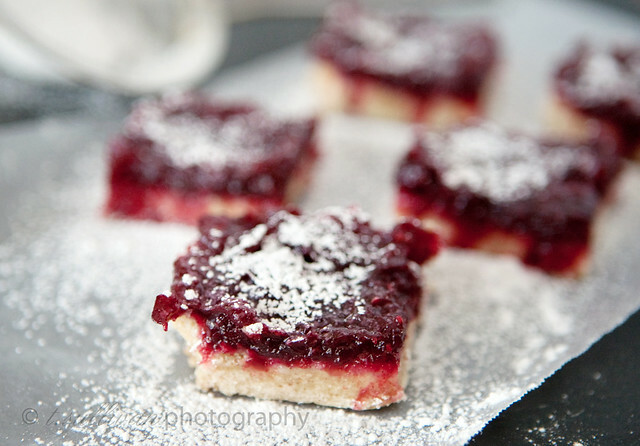 ), so I may have to make up a batch of these since I have tons of cranberries to use up. Yum! Love the color. Very festive flavors too. Bet they are delicious.